Feeling down about the Boston Bruins missing the postseason for the first time since 2007? Fear not, Black and Gold faithful. The past seven years have given Bruins fans plenty of celebrate with memorable games, clutch goals, and improbable comebacks. Here are five of the best postseason moments from Boston’s postseason adventures. Game one of the 2010 Eastern Conference Semifinals between the Bruins and Philadelphia Flyers was a nine-goal thriller at TD Garden. Philadelphia battled back from a two-goal, third period deficit to force overtime with the game tied at four. The Bruins applied relentless pressure on Flyers netminder Brian Boucher. He stopped every shot thrown his way in the extra session. After missing 25 games with a Grade Two concussion suffered in Pittsburgh, Marc Savard returned to the lineup and unleashed a rocket, beating Boucher at 13:52 of overtime to seal the deal for Boston. The moment the red light lit up so too was Savard’s wide-eyed face who raucously banged his stick on the ice and tossed it into a frenzied sea of black and gold. Savard’s OT goal and its accompanying reaction was one to savor, even though the rest of the series was not for Bruins fans. Nathan Horton’s three seasons in a Bruins uniform will forever be linked to his heroics in the 2011 Stanley Cup Playoffs. The 29-year-old winger scored eight goals and 17 points during Boston’s fairytale run to the title. He scored the double-overtime goal in Game 5 against the Montreal Canadiens and the series-clinching marker in Game 7 to eliminate the hated Habs after a hard-fought series. Horton’s Game 7 heroics would be on display once again in the Conference Finals against the Tampa Bay Lightning. He was responsible for the only goal in a 1-0 victory in a penalty-free game that many regard as one of the best game sevens in recent memory. Along with goaltender Tim Thomas’s stellar play between the pipes, Horton’s impeccable timing for big goals played a huge role in Boston’s march to the Stanley Cup. It was the game that put Boston back on the hockey map. It was David and Goliath on ice as the Bruins faced the heavily favored Canadiens in Game 6 of their first round series in 2008. Boston was 10 minutes away from elimination, but responded with third-period goals from Milan Lucic, Phil Kessel, and Marco Sturm to stun the Canadiens 5-4, pushing the series to an unlikely seventh game. After Kessel’s goal gave the Bruins a 4-3 lead at the time, play-by-play man Jack Edwards uttered his famous phrase that will forever be synonymous with this game. Boston would fall 5-0 two nights later in Montreal, but the series, especially Game 6, laid the foundation for Boston to regain its status as a hockey town. Two years ago, the Bruins and Maple Leafs faced off in the first round. The upstart Leafs pushed the series to a decisive game seven in Boston. Nazem Kadri’s goal extended Toronto’s third-period advantage to 4-1 with just over 13 minutes left in regulation. Fans began to head for the exits as the Bruins offensive attack continued to flat line. Horton’s goal midway through the third appeared to be a mere consolation prize. However, Milan Lucic and Patrice Bergeron scored 33 seconds apart with the goalie pulled to tie the score at four. The Garden crowd exploded after Boston’s alternate captain sent the game into overtime. “St. Patrice” would eventually be the one to finish off the Leafs. After a Tyler Seguin one-timer was denied by James Reimer, a net mouth scramble ensued as sticks and bodies went after the loose puck. Bergeron put it past the Toronto goaltender, setting off wild celebrations all over Boston. Vancouver was the setting for game seven of the 2011 Stanley Cup Finals between the Bruins and Canucks. Before the game, Nathan Horton took a bottle of TD Garden ice and poured it on the Rogers Arena ice prior to the game, claiming “it’s our ice now”. Boston went out and played like it. Led by head coach Claude Julien, a calm, composed, and focused Bruins bunch performed well that night as Bergeron and Brad Marchand each scored twice in a comprehensive 4-0 victory over the Presidents Trophy winners. 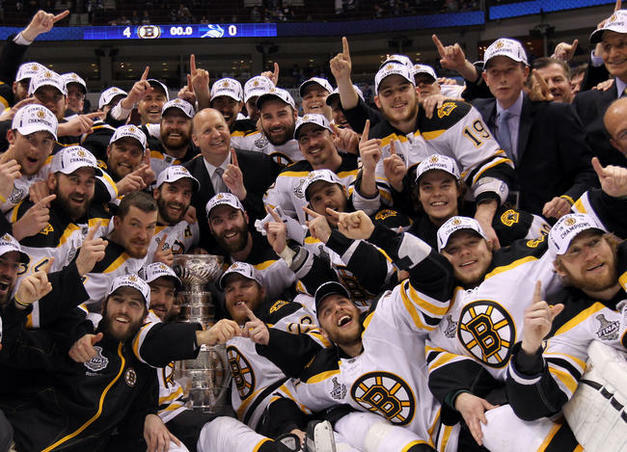 Bruins radio play-by-play man Dave Goucher put it best as the countdown to glory was on. 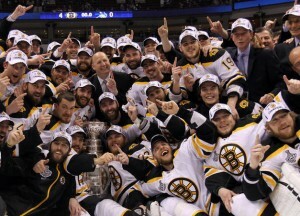 Thirty-nine years of patience had finally paid off for Bruins Nation.